Pope Benedict has moved two of his predecessors, Pius XII, and John Paul II, closer to Roman Catholic sainthood. John Paul II is credited with helping to end Communist rule in Europe, especially in his native Poland. But the beatification process of Pius XII, who was Pope during the Second World War, has been a source of tension with some Jewish groups. They have accused him of not doing enough to prevent the deaths of Jews during the Holocaust. Jewish groups had asked the Pope to freeze the process that could lead to eventual sainthood for Pius until more Second World War archives could be studied. But the Vatican has defended the wartime pontiff, saying he saved many Jews by having them hidden in religious institutions in Rome and abroad. Pope Benedict approved a decree recognising Pius' "heroic virtues" meaning that he will have the title "venerable". It puts him two steps away from eventual sainthood - he must first be beatified and then canonised. Pope Benedict has also approved the "heroic virtues" decree for his immediate predecessor, John Paul II, whose papacy lasted 27 years. Just a month after John Paul's death in April 2005, Pope Benedict waived a five-year waiting period before the sainthood process could begin. The next step will be the recognition of a miracle attributed to John Paul II, usually a medical cure with no scientific explanation. In John Paul's case the miracle under consideration, which is subject to another papal decree, involves a French nun who was cured of Parkinson's disease in 2005. 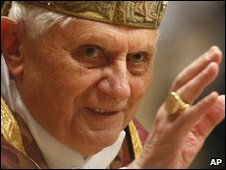 If Pope Benedict approves the miracle, which is expected in 2010, then John Paul II can be beatified, the last step before sainthood. Meanwhile Australia is to have its first Roman Catholic saint. In a separate decree, Pope Benedict approved a second miracle attributed to a 19th Century Australian nun, Mother Mary Mackillop. She was beatified for one miracle by Pope John Paul II in 1995. The approval of a second paves the way for her to be formally declared a saint at a canonisation ceremony in 2010.